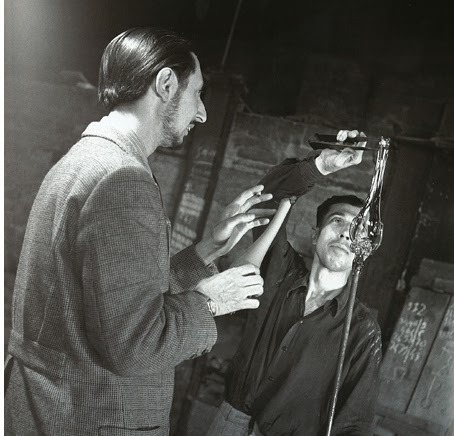 The footage of Peter Voulkos constructing a huge ceramic piece in this video is incredible. See that cat right there? We were scowling like that by Sunday evening. Between the holidays, a bad work week, and very unproductive trips to thrift stores (if they were even open!) and a HUGE antique mall, it was all storm clouds for us. Fortunately, a last minute schedule change practically dumped us into virgin thrift territory and we found our silver lining. Heller glass container by Massimo Vignelli. It's always nice when digging through the plastic junk section to find something of actual value. We found this earlier in the week during one of several anemic trips. I pulled my first Heller ever out of a generic picnic basket full of made in china junk a couple months ago and this is my second ever Heller score. I picked this Robert Maxwell ashtray up while getting an oil change earlier in the week (you may have a problem if you schedule everyday errands around your habit...). I guess this doesn't really make up for leaving a pair of these behind a couple weeks ago. Speaking of Robert Maxwell, Janel spotted this Stoneware Designs West bowl/planter. As far as we knew by Sunday afternoon, this was the culmination of our weekly thrifting. Admittedly, one can't complain too much in this scenario. Not sure if you can tell what it is (jk), but this is seriously the foot of some kind of deer with a bottle opener attached. I know, right? Please keep reading for more "mind-boggling" taxidermy [at the end]. It all really started to turn around when I picked up this large three-tiered macrame hanging shelf. I literally don't even understand how this thing works, but it is so great. I walked over to where Janel was to show her my macrame shelving unit and then she said "I think I found something cool" which, this like-new Pottery Craft hanging planter (a theme!) is pretty cool. But then I found these Iittala Arkipelago glass candle holders and felt about a billion times as cool as Janel (which, seriously). Also, officially, our first Iittala! OK, so Janel spotted this huge (like 2ft tall) Metlox Poppytrail Aztec coffee carafe, and it was unsigned, and we weren't familiar with the line, so we Tweeted #thriftbreak and successfully ID'ed the piece before leaving and now we have this awesome mid-century ceramic piece; seriously check out the lines on that thing. Big shout-out to #thriftbreak on Twitter! We've been adding stuff to our Etsy store like every day, and I think that's helped our selling slump. We also can't wait to start adding the new stuff we've found. I may have screamed when I saw this. This is a real dead taxidermy Giraffe torso. How this made it from real life to being mounted in the back of a Temecula, CA (look it up) antique mall is beyond me. I wish I had reason to write the next chapter in this glorious beast's life, but alas...could be yours for the low low price of $8,000.00. .I feel like I have a hangover from thrifting this week. I think I hit between 15-20 places, which is maybe normal for some people, but it's some kind of record for me. I have a lot to show for it, fortunately; too much to include here. Holy candel holders! Selandia, Dansk, Kosta Boda, L.E. Smith...The black Dansk-ish spider in the front is unsigned. Three of the five three corner ones are unsigned but made in Denmark. Very large [13"] Los Castillo style married metal dish. Stamped "Heche en Mexico" on the bottom, but no maker's mark unfortunately. There are 11 Eva Zeisel for Federal Stockholm glasses in this photo. I found eight at one place. A Don Freedman for Interlude wall hanging, signed with original sales tag. Picked up the blue plastic Stelton vacuum jug designed by Erik Magnussen on the right. Stainless Lauffer for Stelton Cylindra water jug designed by Arne Jacobsen on right for comparison. Three Taylor & Ng christmas mugs with old Japan label to go with the one we already had. 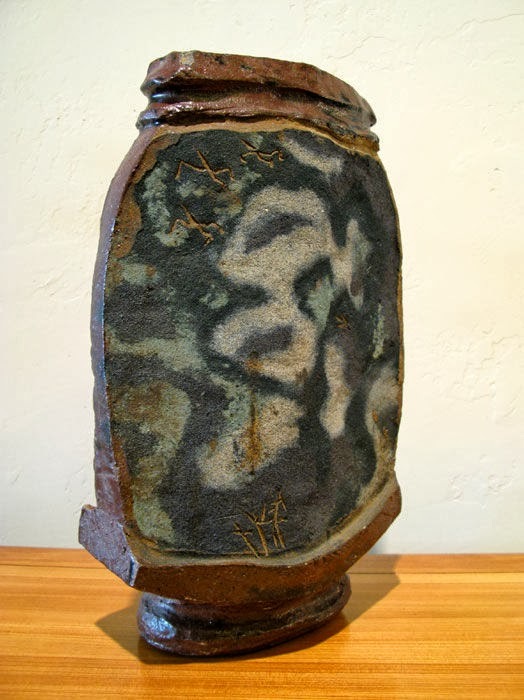 I left this David Stewart for Lions Valley stoneware cat planter behind two weekends ago for some reason. I found it online later in the week and went back to find it still waiting for me. Two of Four Dansk serving boards. Love these shapes. Not pictured: Dala, Rya, Rosti, Robert Maxwell, Emalox, Figgio Flint, Vera, Denby, Christian Dior...I feel like it was a good week! 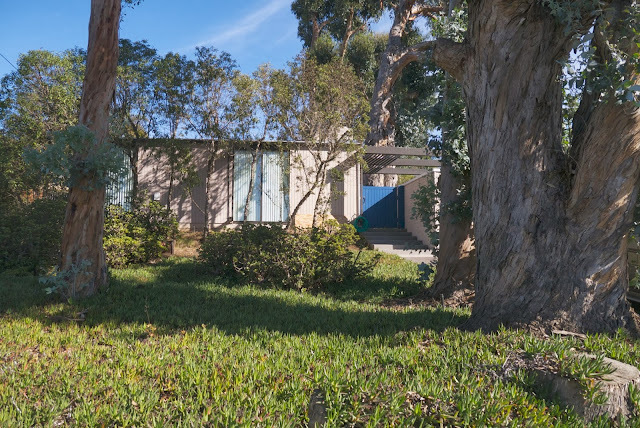 Having developed a bad case of cabin fever as a result of holiday domesticity, we drove to Encinitas this past Sunday to take a gander at a house designed and occupied by Gretta Grossman. We also did some site-seeing and thrifting (ref. this post). Click through for the full report. Half way through writing yesterday's post I realized I had too much to show in just one post. After finding a pair of Ben Seibel bookends I thought I had exhausted my thrifting mojo for the weekend. Janel and I took a field trip to Encinitas to visit a house designed by Gretta Grossman, after learning about it from Esoteric Survey's Instagram. More on this in a later post. How was everyone's Thanksgiving? We hosted three separate events Thursday, from an oyster and champagne breakfast, through a large and traditional dinner, to a cocktail "hour". We're thankful for all our friends who took the time to hang out with us throughout the day. Black Friday found us sleeping extra late and then contemplating staying home all day to avoid any of the annoying ultra-consumerist cluster that defines the after-holiday tradition. Fortunately we couldn't stand another whole day at home and made our way to the final hour of a nearby thrift's half-off sale. I say fortunately because we got some great stuff! This school of brass fish "dishes" is likely actually a set of ashtrays, but too good to have left behind. Three Kiln Craft mugs. Check out the mice an cheese being tossed by the cat cook! Janel found these. I wanted to say no, but they're just too perfect, and the cats art actually molded in relief and nicely glazed. We love Pottery Craft. The tall vase on the left may not be PC, but it's got a similar glaze. The pieces to the right, however, are both marked. The middle one is my favorite PC ever so far. The bowl on the right of the last photo is signed via mold marks on the inside, which I've never seen anything like it. Our Nemadji collection will soon be out of hand; somebody buy some of these already! This one's on the smaller side. Nice large set of brass candlesticks. 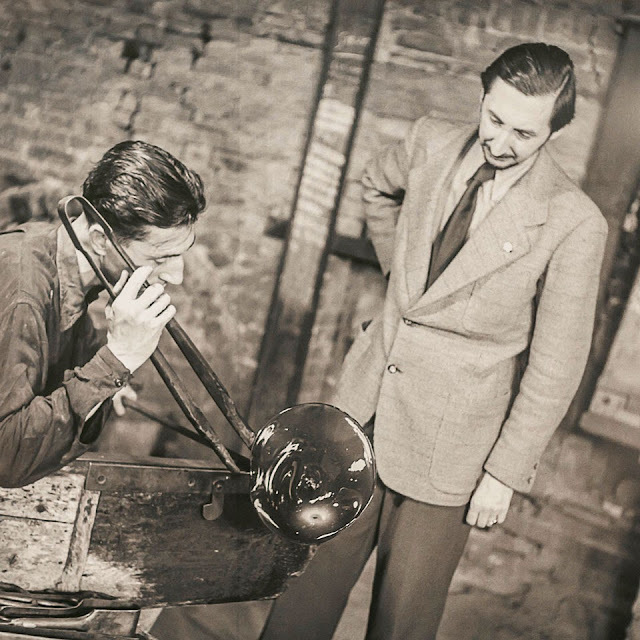 This brass quail is threaded at the bottom to be used as a spigot handle. How cool is that? So I'm really excited about these Ben Seibel bookends. Spotting them was a little like walking out your front door and seeing a unicorn in your front yard. The patina is heavy and one has a crack, but we got them for so cheap it's embarrassing. I thought these would be the biggest find for some time, but wait for part two tomorrow to see what else we found! It's been a slow week with our thrifting activities being incidental side trips rather than all day campaigns. 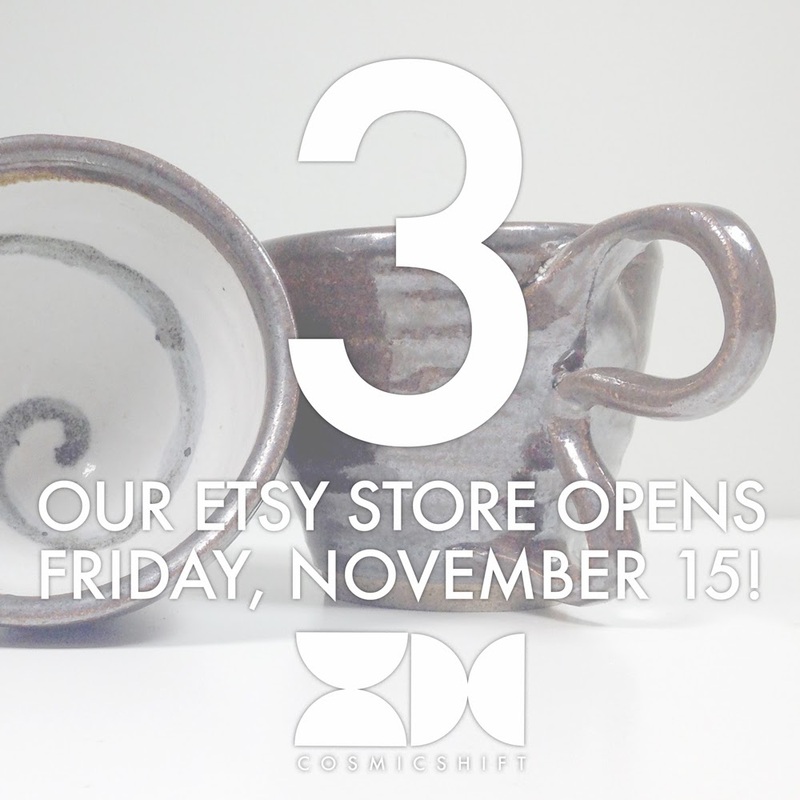 With our Etsy store being open, there's a lot more to focus on than just acquisition. Fortunately one of the new areas of focus is shipping orders–big thanks to everyone who has purchased from us! To all ceramic artists out there: maybe try signing your work with a bare minimum of legibility...or I could just get better at IDing stuff. This pitcher is beautiful and I wish I knew who made it. We've barely posted a third of our inventory in our shop, and we plan on constantly updating, so please check in often. In the meantime, we've got some new items to add to the queue after the jump. 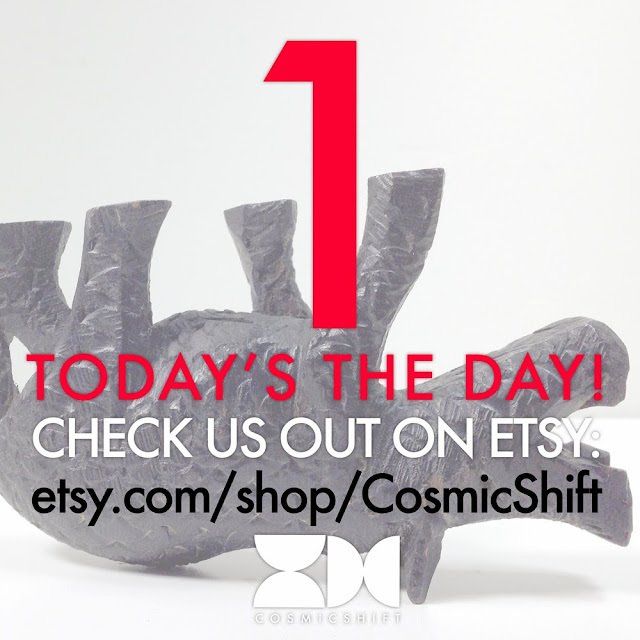 You heard we launched our Etsy store last Friday, right? To celebrate, we headed up to Santa Ynez Valley to go wine tasting. We stayed at a Super 8 motel Friday night and were pleasantly surprised to find two large thrift store within walking distance. Lo and behold, they were both great! Countdown: We're Open For Business! Go check out our store! Let us know what you think. Remember how we didn't make it out last weekend? Well, I couldn't stand it and went out one afternoon this week. Fortunately, it ended up being one of my favorite hauls so far! Found my first Kokeshi doll! I'm really impressed with the level of details on this, like the cut patterns on the bun and bottom and the beautiful red staining and super subtle flowers on the kimono. It's larger than I expected too, at about 6" tall. Keeping with the theme of wooden Japanese figures, I found this hors d'oeuvre toothpick holder in the shape of a pig. Guess this would be perfect for tiny pork sausages or something? This pig definitely has a world weary expression. Some of the holes had broken toothpicks jammed inside, so I drilled them out. I'm always uncertain about how much to clean, repair, or refinish objects, but it seemed like a no-brainer on this one. How about this *huge* Tonala owl, eh? Amiright? It's only signed "Mexico", so it's not Ken Edwards or Jorge Wilmot, but it's HUGE! I'm always looking for good vintage Christmas stuff, and it's hard to come by. What says "Christmas" better than two nefarious-looking blue-eyed reindeer and a giant lump of coal? This is a detail from an amazing Japanese printed handkerchief in perfect condition. I didn't even notice the black rabbits until after I bought it. I'm a sucker for handkerchiefs and an even bigger sucker for kachinas. Guess what...? This! Ooh, I also found a huge G. H. Bass & Co. canvas and leather duffel bag from the 90s. I forgot to take a photo. It's in great condition even thought the top is super faded and the leather has an amazing patina. That's all for now. 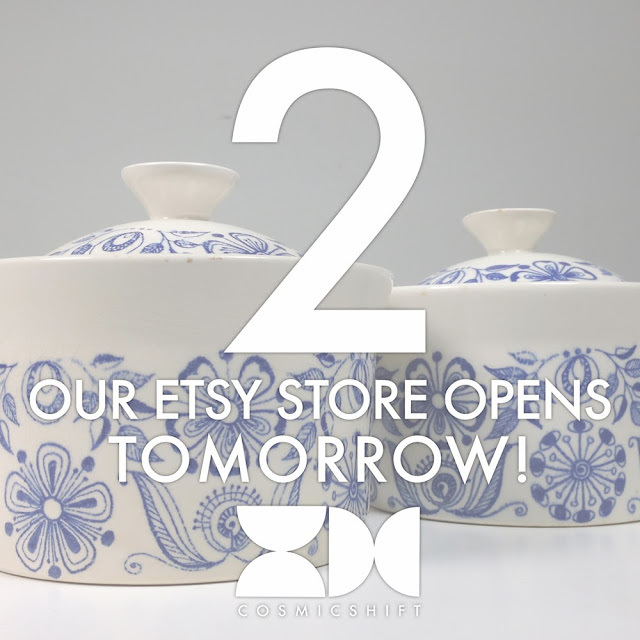 Can't wait to get this stuff in the store, which opens...wait for it...TOMORROW!